When people think of Kentucky, a montage of horses, bourbon, Jennifer Lawrence (a Louisville native), and fried chicken spring to mind, but perhaps not beer cheese. When I say beer cheese, I don’t mean the flavorless, at-times gelatinous, warm dip found in breweries and at Oktoberfests. It’s not beer cheese in the way we Kentuckians recognize it. I’m talking about the savory cold cheese-and-beer spread invented in the Clark County town of Winchester—which is also the home to the gingery Ale-8, the only soft drink still manufactured in the state. It’s difficult to explain what beer cheese tastes like, as it has hints of beer, spices, and cheese, yet it’s incomparable to anything else. The flavors are further enhanced when served with crudités and crackers, or hard and soft pretzels. In 1939, Johnnie Allman opened his first restaurant, Johnnie Allman’s And The Driftwood Inn, on the Kentucky River. His cousin Joe Allman had been a chef in New Orleans and Arizona. As the legend goes, Joe created a spicy appetizer spread called Snappy Beer Cheese at Johnnie’s restaurant to coerce more patrons to purchase beer. The dip was made from cold-pack Wisconsin cheddar (a kind of thick pre-made cheese spread that comes in a tub), flattened beer, garlic, and cayenne pepper. The Driftwood closed in 1945 but the Allmans kept the beer cheese tradition alive with a few other restaurants over the years. They endured everything from fires to floods, but they soldiered on. Hall’s On The River (now located where the Driftwood was) took over the beer cheese reins from the Johnnie, who retired in 1978 and died in 1989. Today, Hall’s is one of eight locations on The Beer Cheese Trail (yes, a whole trail! ), and is the place where many Kentuckians first tried the addicting cheese spread. In 2013, the state legislature passed a statute that named Clark County as the birthplace of beer cheese (take that, the rest of the world). Even though beer cheese is made from the two greatest food items in the world—beer and cheddar cheese—it’s rarely seen outside of central Kentucky, or if it is, it’s usually a bastardized version, not what’s found in Winchester, Lexington, or Louisville. Everywhere you go in those towns, streets seem to be paved with beer cheese. Louisville has an entire section of restaurants and breweries on Bardstown Road (Beer Cheese Row) serving their salmon-colored beer cheese (it’s pink because they mix white cheddar with hot sauce). Outside of the Bluegrass State, pockets of Kentucky-style beer cheese can be found in Cincinnati, Michigan, Chicago, and New York, but the West Coast seem to be bereft of beer cheese. Lexington native Olivia Swan, who retails Olivia’s Beer Cheese and ships it all over the country, compares Kentucky beer cheese to barbecue. “There’s Memphis barbecue, Carolina barbecue, Texas barbecue, Kentucky barbecue—and they’re all very different takes on barbecue,” she told me. “That’s how I see beer cheese. I’ve never had beer cheese outside of Kentucky that tastes anything like Kentucky beer cheese.” Jim Carden, another Lexington native, co-owns Brooklyn bars Floyd, NY and Union Hall. He created beer cheese so customers could have an affordable snack and also so they could also learn about this weird food from Kentucky. “Our [recipe] was very Kentucky and very much based on Kentucky influences,” he said. “We definitely stuck to our roots.” I think it’s the most authentic Kentucky beer cheese outside of the Bluegrass State. It’s unclear why beer cheese hasn’t migrated from Kentucky. With the exception of Austin and Nashville, beer cheese barely exists in the South, where pimento cheese reigns supreme. My journey to beer cheese began almost seven years ago, when I moved from Chicago to Covington, Kentucky, located across the Ohio River from Cincinnati. One day, while shopping in one of those cavernous party supply/liquor stores in Northern Kentucky, I picked up this strange beer cheese product I’ve never heard of before. The brand was Kentucky Beer Cheese, and I was drawn to its picture of a cute mouse holding a stein of beer. I took it home, tried it, and fell in love—with beer cheese, not the mouse. 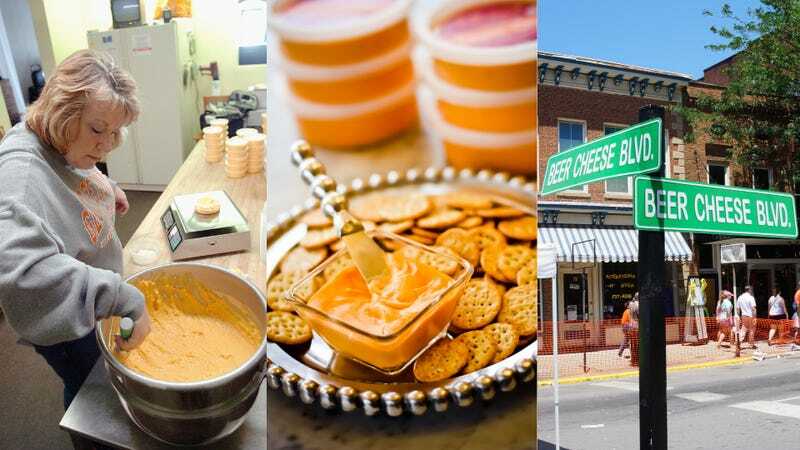 Upon Googling “beer cheese,” I discovered that every June the town of Winchester, 30 minutes southeast of Lexington, hosts the Beer Cheese Festival. In 2014 I attended the festival, and in 2016 I returned as a judge of the amateur beer cheese competition. Beer cheese became such an obsession of mine that I wrote a 216-page book on the subject: The University Press Of Kentucky published The Beer Cheese Book, the first volume written entirely on the obscure Kentucky food, last year. Despite a typical beer cheese recipe containing a handful of ingredients, most recipes are cloaked in mystery, to the point people won’t tell you what kind of beer or brand of cheese they use. As a result, I had to concoct my own recipes for the book, such as beer cheese risotto, beer cheese buttermilk biscuits, beer cheese quesadillas—basically just substitute beer cheese for anything with cheese. The original Allman’s recipe is supposedly out there somewhere, though if you ask the family, they won’t tell you what’s in it. In 2009, they resurrected the brand for retail. The first published beer cheese recipe came from Marion W. Flexner, who published hers in the 1949 cookbook Out Of Kentucky Kitchens. She hand-blended sharp cheddar “rat” cheese, garlic, Worcestershire, mustard powder, Tabasco or cayenne, and beer together. With the craft beer explosion, the combinations of beers and cheddars are now infinite, compared to decades ago when PBR and Budweiser were the de rigueur suds used in beer cheese (although some people still use those). To make your own beer cheese, find a beer you like. Hoppy beers, lagers, ambers, and dark beers work well. It’s important to first decarbonate the beer by either leaving the beer out overnight or whisking the bubbles out of it. Shred some cheddar cheese (please, for the love of God, no Velveeta). Grind the cheese, some garlic cloves, spices, and maybe some jalapeños or pimentos—make it as spicy or mild as you want—in a food processor with the beer, and voila, instant beer cheese. True Kentuckians don’t need a special occasion to make beer cheese, but the Kentucky Derby, holidays, University Of Kentucky games, and the state of the world are good enough excuses to slather beer cheese into their maws. But honestly, it’s always an opportune time for a comfort food like beer cheese. Recipe by Andy Myers of Louisville’s Gralehaus. Makes about 2 1/2 cups. Blend the buttermilk, garlic, hot sauce, and cream cheese in a food processor for 30 seconds. While the food processor is running, add the beer and the cheddar, alternating between approximately 1 ounce of beer and approximately 2 ounces of shredded cheddar until it’s all incorporated. Once it is all added, let the food processor run for an additional 5-8 minutes, or until the mixture is completely smooth. You should not be able to see any small bits of cheddar. The beer cheese should be one homogeneous spread. Garnish with chives to serve.